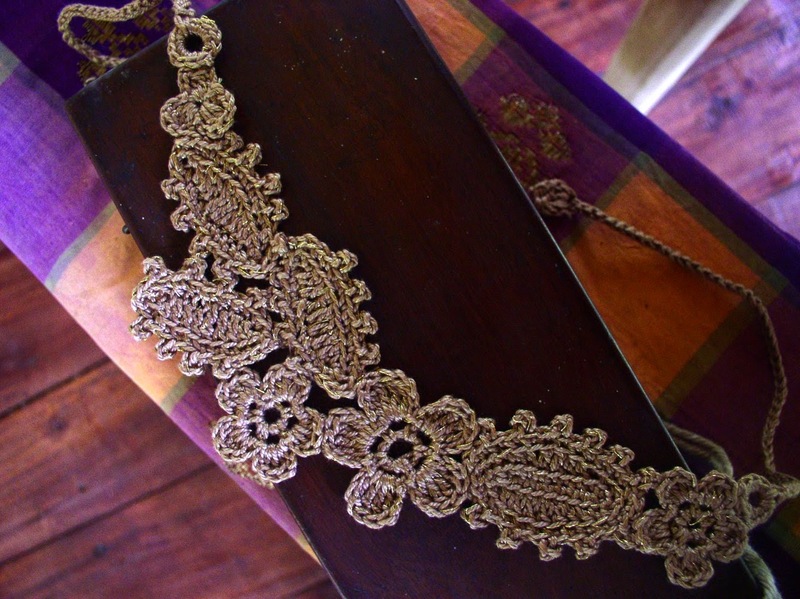 Mountain Gold is a necklace made by sewing crocheted motifs together. 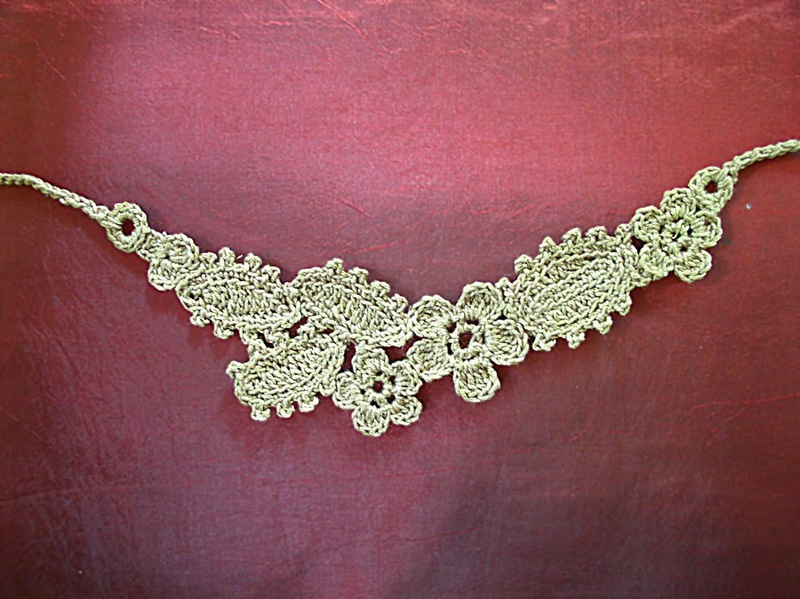 If you enjoy making motifs and sewing them, then you might like this pattern. Please let me know if you have an problems with the pattern or if you spot any errors so that I can correct and update the pattern. Back Loop Single Crochet (BLsc): Work sc as normal except that you insert the hook not in both loops of the st, but the loop that is further away as you look at the work. 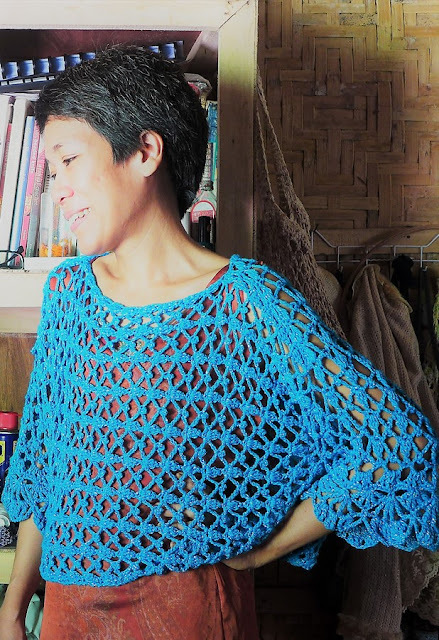 The result is a softer, stretchier fabric that looks very different from stitches worked in front loops only or in both loops. Picot: Ch 3, sl st in base of ch-3. 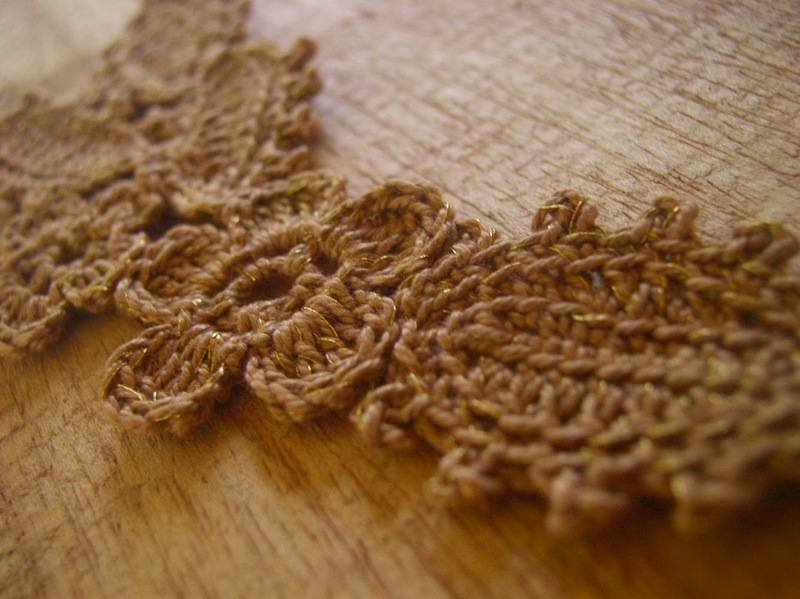 For all motifs, use one strand of brown cotton thread and one strand of gold embroidery thread held together. Ch 5. Sl st in 1st ch to form ring. Rnd 1: Ch 1, *sc in ring, ch 3, rep fr * 5 times ending last rep with sl st in 1st sc to join. Rnd 2: Ch 1, sc in 1st sc, *ch 3, 3 tr in next ch-3 lp, ch 2, sl st in next sc, rep fr * 5 times. Fasten off. Ch5. Sl st in 1st ch to form ring. Rnd 2: Ch 1, sc in 1st sc, *ch 2, 3 dc in next ch-3 lp, ch 2, sl st in next sc, rep fr * 5 times. Fasten off. Rnd 1: Ch 1, sc in 2nd ch fr hook and in each ch across, 2 more sc in last ch to turn to other side of of foundation ch, sc in next ch, hdc in next 2 ch, dc in next 3 ch, hdc in next 2 ch, sc in last ch, sl st in 1st sc to join. Rnd 2: Ch 1, 2 BLsc in same sc, BLsc in next st, *picot, BLsc in next 2 sts, rep fr * all around leaf, ending with sl st in 1st sc. Fasten off. 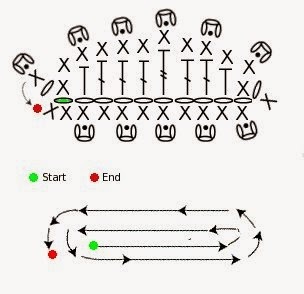 Rnd 1: Ch 1, sc in 2nd ch fr hook, hdc in next ch, dc in next 2 ch, tr in next ch, dc in next 3 ch, hdc in next ch, sc in last ch; ch 1, 2 BLsc in last ch (this turns you now to other side of foundation chain), BLsc in next ch, *picot, BLsc in next 2 sts, rep fr * all around leaf ending with sl st in 1st sc to join. Fasten off. Ch 4, sl st in 1st ch to form ring. Rnd 1: *Ch 2, 2 dc in ring, ch 2, sl st in ring, rep fr * 2 times. Fasten off. Rnd 1: Ch 1, 10 sc in ring. Fasten off. Using the photograph above as guide, arrange the motifs and pin together. Turn over and sew atthe back with matching color thread. To make the ties: With two strands of brown cotton thread held together and larger hook, join to ring with two sc, ch 54, 3 tr in 4th ch fr hook. Fasten off. Rep for other ring. Weave in tail ends and block flat.